Dust-Free Sanding - Yes it Exists!!! The days of hanging plastic, covering every surface, and vacating your home for a dusty nightmare are over. 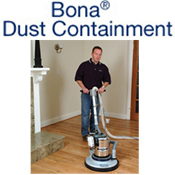 Bona’s innovative dust free sander, the Bona Atomic DCS, connects a powerful vacuum motor to sanding equipment. The combination virtually eliminates airborne dust generated while sanding. At the same time, Bona’s Atomic Dust Containment Systems are the most advanced and powerful dust containment systems in the world. They are capable of reducing dust far beyond even what traditional sanding generates. Glen Floors carries a complete line of commercial products. Listed below are the market segments that we have experience in. Click Here to go to our commercial section or on a link below to explore a particular market segment.